Take a look at the nation’s cities and you will see some marked differences. Some urban ecosystems, like Seattle, Palo Alto, Austin, and Boston, have emerged as meccas for talent and investment and are buzzing with startups, fast-track companies, and entrepreneurial activity. Elsewhere, once-thriving metropolises have plunged into a state of distress as traditional industries have collapsed, and entrenched racial and economic divisions have spawned conflict that has triggered the flight of people and capital. Many other cities lie between these two categories, and are seeking to seed new sources of vitality to stave off the forces that would send them tumbling into the latter category. What makes the difference? A century ago, the Sufi mystic Hazrat Inayat Khan wrote, “Some people look for a beautiful place, others make a place beautiful.” This article focuses on creating beautiful places where people and economies can thrive. Like Inayat Khan, we believe it is people who write the future of cities; beautiful places are created when people find ways to work together across boundaries to claim a common future that benefits all. In a competitive global economy it is about creative and collective leadership—a dynamic process that requires continual adaptation and innovation. This common future depends on leaders who can shape new solutions to emerging challenges and revitalize our communities in ways that benefit all stakeholders. Innovation that creates beautiful cities largely happens through place-based activities and investment. The long-term success and sustainability of place-based innovation occurs when these efforts are floating all boats rather than causing greater inequity. Accelerating place-based innovation involves adopting efforts that are interconnected, rather than isolated from one another. To be successful, cities and communities need to seek opportunities to share promising practices, lessons learned, and potential collaborative connections. These connecting points are even stronger when cities collaborate within one state or geographic region. The challenge is that communities and cities often take innovation for granted: they expect that it will flourish on its own, that innovation ecosystems will be inherently inclusive, and that efforts to accelerate innovation within cities will naturally connect with similar efforts in other cities. Our experience is that nothing is accidental. Cities interested in creating inclusive entrepreneurial ecosystems must take a highly intentional approach and be committed to sustained public and private investment of time, energy, and resources by all stakeholders in the community. This paper is organized around three central questions: (1) What are the specific elements of a healthy entrepreneurial ecosystem? (2) What can be done to foster inclusion within this kind of ecosystem? (3) How can national and regional place-based strategies connect with each other? We highlight specific efforts to put the answers to these questions into action, which will help to advance this important work. Both of us come to this work through entrepreneurial talent development. Specifically, we have helped to create dynamic learning pathways for next-generation entrepreneurial leaders through our work with the Center for Creative Leadership and Duke University, and with partners like the Algernon Sydney Sullivan Foundation, articles and book chapters we have written together, as well as a book that Christopher coauthored with Gregg Vanourek, titled Life Entrepreneurs: Ordinary People Creating Extraordinary Lives. But simply awakening and empowering really good entrepreneurial talent is not enough. Long-term success means paying attention to the fertile ground in which those seeds are planted. If talented entrepreneurs land in cities or communities that don’t embrace their entrepreneurial spirit, they will wither. Cities can’t afford to squander this creative talent—especially those that need entrepreneurial activity to grow new jobs and replace older, declining industries. Having a creative entrepreneurial base gives cities a competitive advantage. Creative work is correlated with innovation and economic growth, as well as higher wages.1 According to the U.S. Small Business Administration, firms that are less than five years old create more than 65 percent of net new jobs.2 Our country cannot borrow or spend its way forward, thus innovation is the way of the future. Entrepreneurship will be one of the nation’s major growth engines, and our cities will have to innovate in order to stay ahead of the game. However, having an isolated island of creative and entrepreneurial activity within a community is not adequate. Evidence indicates that increasing the number of creative jobs in a city can also cause disparity, as individuals who are not part of the creative economy are often further marginalized by an influx of job seekers and the rising costs that follow.3 It is important, therefore, that stakeholders across a community join together to direct their innovative energy and entrepreneurial spirit to tackle inequalities and tough challenges in education, health care, environmental impact, poverty, and more. How do we create the intentional environment to foster place-based change-making? An attempt to answer this question is how Bull City Forward, where Christopher served as founding executive director, came into being. Durham, North Carolina, is a hotbed of talent development. In addition to Duke University, North Carolina Central University, and Durham Tech, Durham is one corner of the Research Triangle comprised of the University of North Carolina at Chapel Hill and North Carolina State University. Once a booming international hub for tobacco and textiles and home of one of the nation’s premiere African American business communities (known as Black Wall Street), the city hit tough times in the latter part of the 20th century and the downtown emptied out. Young entrepreneurial talent had no incentive to stay in the Bull City. Left in the wake were a number of beautiful brick warehouses. In the early 2000s, supported by city and university partners (particularly Duke), a group of pioneering investors began to redevelop downtown Durham. This led to another question: How could the city create the right conditions to recruit and retain a creative and entrepreneurial talent pool? In response to this challenge, a group of community leaders who named themselves Bull City Forward came together to answer the question by creating a city where innovation never sleeps. We first assessed the field by mapping the assets and strengths of the community and what gaps we needed to fill. We then looked at promising practices in cities around the world, including Helsinki, Pittsburgh, Seattle, and Providence—13 in all. We also looked at the research and work of Living Cities, the Surdna Foundation, the Annie E. Casey Foundation, Ashoka, Social Venture Partners, New Profit Inc., and the Brookings Institution, among others. We wanted to learn as much as we could from successful efforts to harness entrepreneurial energy. We came to realize that there were a lot of really good ideas out there, and some communities, like Indianapolis, were doing a great job developing and recruiting a strong pipeline of entrepreneurial talent. Others, like New Orleans, Pittsburgh, and London, had built robust entrepreneurial support systems. San Francisco, Toronto, and Boston had created model incubator/accelerator spaces, while others, like Providence and Pittsburgh, were smartly tapping into their universities for talent, research, and a new venture pipeline. Data on the impact of these efforts were relatively scarce but increasingly important. While the importance of policymaking was recognized, it was not often directed toward promoting and supporting social and commercial enterprise development. Finally, the importance of access to capital came up again and again. It was relatively thin and not well organized in most communities, San Francisco being one of few exceptions. In short, while there was much to be learned from each community, it was quickly apparent that none was taking a truly comprehensive approach to fostering, developing, and scaling high-impact, high-growth social enterprises. 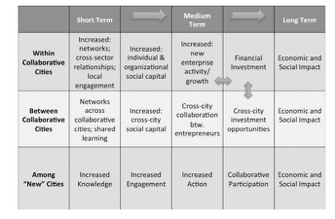 Nevertheless, these collective community-building efforts suggested five key levers for making an enduring impact by developing an entrepreneurial ecosystem: (1) building a talent pipeline through local education efforts, recruitment, and retention; (2) creating a strong enabling environment to connect emerging problem-solvers with the resources and relationships they need to grow (e.g., access to capital, collaborative work spaces, mentorship); (3) developing a robust data-gathering effort to measure the economic and community impact created through entrepreneurial and innovative output; (4) fostering a supportive community and economic development policy environment to garner public support for these efforts; and (5) shining a light on these efforts through storytelling and building a narrative around a community’s burgeoning entrepreneurial community. Despite the burgeoning entrepreneurial movement in the nation’s cities, from millennials to people in mid-career transition to retiring baby boomers, they often work in isolation. Durham is a microcosm of the solution to this important issue: most of our entrepreneurs are connected to one another. If cities help plant thousands of entrepreneurial seeds and create an integrated collaborative environment, those entrepreneurs will stay, they’ll flourish, they’ll grow, they’ll create jobs, they’ll have an impact, and they’ll transform the communities they live in. One thing holding us back from having a truly sustainable economic and social impact is the issue of scale. While there are hundreds of examples of highly dynamic social enterprises, they are just at the surface of much deeper systemic challenges, such as economic inequity, environmental degradation, health-care disparities, and more. Addressing these challenges effectively will not happen at the individual organizational level; even if there are a couple of breakthroughs and someone at the individual level achieves scale, having a sustained impact is very difficult. Developing scaled solutions to social challenges that have staying power will require individual organizations to come together around a common purpose, one that cultivates collaboration and has a collective impact. This will require individuals, community leaders, and funders to change their mindset, but if we can overcome the hurdle of individualism, we have a real shot at moving the needle on a number of important economic and social issues and changing our current trajectory in a positive way. We both are part of efforts to catalyze these collaborative entrepreneurial ecosystems across North Carolina and beyond, and we both are starting to see some tangible success, as measured by new enterprise growth, new job formation, positive community development, an inflow of capital investment, attracting and retaining talent, media coverage, policy influence, and more. Our collective vision is to transform North Carolina into a state where a world-class cluster of creative minds is starting and scaling thousands of innovative for-profit companies and nonprofit enterprises, which in turn are driving breakthrough solutions to our pressing local and global challenges and improving our communities in meaningful and measurable ways. This continually evolving cluster will be sustained by a pipeline of talented problem-solvers, both homegrown and recruited globally. These efforts will be defined by collaboration, sustainability, diversity, and accountability, and the success we envision includes creating tens of thousands of jobs, attracting hundreds of millions of dollars in investment capital, and fundamentally changing the long-term trajectory of our region. However, what has become apparent through the pursuit of this vision is that cities not only have to be intentional about cultivating collaborative, scaled, place-based entrepreneurial ecosystems, they must be intentional about making them inclusive. More specifically, cities need to create a proportional number of minority- and women-led enterprises to reflect the diversity of our communities. Durham, for instance, has significant economic disparity and ethnic diversity. The population is approximately 45 percent African American, 45 percent White, and 10 percent Hispanic—its Hispanic population is one of the fastest growing in the country—but the entrepreneurial landscape does not reflect this rich diversity. In nearby Greensboro, as in much of the nation, there is a slide toward inequality, with some neighborhoods seeing incomes drop by much as 25 percent, despite an overall rise in average community incomes. A Stanford University study found that the proportion of families living in either poor or affluent neighborhoods across the nation increased from 15 percent to 31 percent from 1970 to 2007.4 This degree of inequity is greatest in southern cities; 9 of the 15 where poverty rates are expanding fastest are in the South.5 In a study by the New Orleans Data Center, for example, 60 percent of that city’s population is African American, yet only 2 percent of business receipts are generated by Black-owned enterprises.6 This is neither just nor sustainable. The process of spanning boundaries requires creating opportunities for stakeholders to connect on a human level. In these facilitated interactions, where stakeholders share their stories of identity and aspiration, they often find they value similar things and have common hopes for their families and the future. While this initially slows the process, it pays dividends in sustained outcomes as people work together to tackle complex challenges. Cross-sectoral teams shape solutions using insights and resources from their individual networks and groups. We have seen this pattern play out in our work from North Carolina to Kenya to El Salvador. The teams in El Salvador, which included people from business, civil society, and government, focused on economic development in 50 municipalities across the nation. Given how difficult it is to tackle these complex, interconnected issues within a specific location, cities can’t address them in isolation. Recognizing this, Christopher cofounded a national learning collaborative called Forward Cities (www.forwardcities.org), a two-year multicity learning collaboration between Detroit, New Orleans, Cleveland, and Durham, where the focus is on “inclusive innovation.” The effort is led by Friends of New Orleans and Forward Impact, and includes the Urban Institute, the Aspen Institute, and the Issue Media Group. The coalition aspires to (1) identify ways to develop and support more business entrepreneurs, social innovators, and neighborhood change-makers from low-income communities of color; (2) determine the best way to harness the talent and creativity in our multiple ecosystems to address the most critical issues in our cities’ distressed neighborhoods and communities; (3) strengthen existing networks and accelerate entrepreneurial activity in the participating cities and surrounding areas; (4) foster the sharing of best practices, relationship-building, and entrepreneurial activity among the participating cities and their surrounding areas; and (5) serve as a dynamic knowledge resource for others looking to build their innovation ecosystems. Although this is a structured learning collaborative, each participating city is taking a different approach to developing its entrepreneurial ecosystem. Moreover, each has a distinctive local context and is in a different phase of its ecosystem development. With this in mind, Forward Cities is working to strengthen inclusive local innovation efforts while creating connections across the participating cities. These efforts include forming teams, arranging site visits, connecting and collaborating, building learning platforms, and conducting evaluations and creating tools. Local Innovation Councils and Teams: Local innovation councils have been formed in each participating city to ensure that there is local input and ownership by the key stakeholders in each entrepreneurial ecosystem. Comprising more than 30 private and public local leaders, these councils essentially act as a board of directors to help select which communities to focus on, inform local data-gathering efforts, drive strategic planning, and contribute to collective efforts to strengthen the city’s inclusive innovation ecosystem. A local innovation team—the executive committee—is selected from the councils. It is made up of six entrepreneurial leaders who represent their city at each of the meetings; they also participate in small, moderated leadership sessions with members of the other city teams, which helps to create fellowship between innovation leaders across the cities. Local innovation team members are also responsible for bringing what they have learned back home to their council, thus ensuring that knowledge is captured and shared with all of the key stakeholders in each city. Cross-City Meetings and Site Visits: Building relationships and sharing best practices and knowledge takes place during a series of cross-city meetings that are being held twice a year, for two years.8 The meetings have several goals: (1) allow the host metropolitan area to showcase its innovation ecosystem through site visits; (2) establish relationships between like-minded innovators in the participating cities; (3) share current strategies, models, and visions for each city’s or region’s future community and economic development; and (4) explore ways to share this knowledge with others. The following key questions are addressed at each meeting: How do we ensure that our growing entrepreneurial ecosystem does not leave anyone behind? How do we nurture entrepreneurs from low-income communities and communities of color? How do we encourage more activity by innovative social entrepreneurs and change-makers in our city’s or region’s most distressed neighborhoods or areas? Understanding historic racial inequities and implicit bias has been critical to this work and conversation. Entrepreneurial Connection, Networking, and Collaboration: The more cities understand each other’s communities, the more they can help connect the dots. Given that the collaborative is working with a robust cluster of civic innovators and social entrepreneurs, opportunities to connect them with one another and start up new collaborations abound. For example, entrepreneurial support organizations like Jumpstart in Cleveland, TechTown in Detroit, Propeller in New Orleans, and Invictus Office Center in Durham are finding opportunities to share strategies and look for collaborative opportunities; PowerMoves NOLA and 4th Sector Capital are discussing minority-focused investment strategies; and universities are collaborating around entrepreneurial programming. For example, Duke launched a program for social entrepreneurs in Detroit, with support from Wayne State University. National Learning Platform: To facilitate shared learning across a global network of cities and regions, Forward Cities partnered with Issue Media Group to launch an open-knowledge platform for documenting lessons learned from the collaborative. Products include multimedia profiles of each participating city. Stories of urban innovation are emerging from all four cities, along with community-building models, tools, and strategies, all of which appear on the organization’s website, ForwardCities.org. Knowledge gained is curated and shared through a monthly newsletter. Evaluation and Tool-Building: The local impact of the Forward Cities collaborative and the four innovation councils is being measured through a partnership with the Urban Institute and local research organizations in each city, including Data Driven Detroit, Tulane University, Cleveland State University’s Center for Economic Development, and the City of Durham’s Neighborhood Compass team. The data teams are using data mapping, a set of survey tools, and interviews to measure a set of outcomes, as shown in Figure 1. As this work evolves, we are discovering many opportunities to educate key stakeholders who can become powerful advocates for the importance of improving support systems for social innovators and business entrepreneurs (e.g., those who influence policy, city and state leaders, universities, funders). We hope this work and the ensuing research will not only have a measurable impact but will influence relevant policy at the local, state, and federal levels. To help further such understanding we will publish our key findings. The Forward Cities team also shares lessons from the collaborative with national foundations, support organizations, and federal government agencies through its learning platform, and through presentations it makes to related national and international networks. One exciting opportunity to replicate this work is through a similar two-year learning collaborative that involves multiple North Carolina cities. Although the state is notable for its pioneering efforts to build innovation clusters, such as Research Triangle Park, and for cities like Durham, Raleigh, and Charlotte that are increasingly recognized as hotbeds of entrepreneurial activity, not all communities are experiencing this renaissance. In fact, a recent study by the Institute for Emerging Issues found that North Carolina sits well below the top quartile of states on key innovation indicators, including output and compensation, and it even trails the U.S. average. Current trend lines offer no sign that North Carolina will reach the top quartile, unless it gets many more people in more cities involved in a turn-around effort that reconstructs its innovation model and expands its innovation capacity. With this in mind, more than ten statewide partners have come together to launch InnovateNC (www.innovatenc.org) using the Forward Cities design.9 The goals are fourfold: (1) increase innovation capacity, activity, and connectivity; (2) broaden the demographic and sectoral diversity of those engaged in the innovation economy; (3) increase collaborative cross-city learning and partnerships; and (4) increase visibility and financial support for innovation district efforts. To ensure broad geographic reach and strong community buy-in, a competitive request for proposals process was launched in the summer of 2015. Interested cities outlined their current innovation efforts, gaps, and vision for the future; their existing organizational capacity; the diversity, influence, and depth of local partners committed to their effort; and resources available to measure progress. Each community also committed $15,000 in local funding. InnovateNC launched in December 2015, when it convened its first meeting. Under the leadership of its local innovation council, each community is now completing an innovation ecosystem asset map to assess its current policy landscape, and also developing a strategic plan to be launched after the meeting in June 2016. In addition to the impact this work could have within North Carolina, InnovateNC hopes to set a precedent for other states interested in taking their innovation economies to another level. By fostering place-based innovation economies in five cities across the state and then plugging them into other vibrant entrepreneurial ecosystems in the Triangle and Charlotte, InnovateNC is creating a truly scaled interconnected movement. What if this movement could be accelerated through creative state policies designed to advance inclusive innovation? One strategy could be to create a competitive North Carolina Community Innovation Fund, which would be a competitive block grant dedicated to helping communities foster local entrepreneurship, similar to the North Carolina Department of Commerce’s Main Street Program, which focuses on revitalizing historic downtown areas. Communities would compete to participate in the Community Innovation Fund by presenting a compelling local entrepreneurial acceleration plan with measurable outcomes, a clear implementation timeline, broad stakeholder engagement, and evidence of matching local funds to invest in the plan. The communities selected would work with assigned innovation experts to refine the plan before receiving the initial matched funds. Once specific milestones were reached, additional funding would be available to scale the impact. Success would be measured by the number of new businesses launched, the number and quality of jobs created (measured by their broad demographic reach), and the amount of additional private-sector investment generated. For instance, according to an economic impact study by the Main Street Center, every $5,000 invested through its fund created ten net new jobs in Main Street districts, three new businesses, and $691,000 in private-sector investment. The Community Innovation Fund could be measured by its entrepreneurial output through the state, including progress on minority entrepreneurship. The Community Innovation Fund would also help generate significant new investment opportunities for local and national venture funds. This in turn would help leverage the Venture Multiplier, a policy initiative newly proposed by the governor and state treasurer to help fuel the growth of North Carolina venture funds by creating a matching investment vehicle and increasing investment in local enterprises. There is no reason these ideas need to be restricted to North Carolina. For states—and the nation—to be competitive, we need to invest in our local innovation economies and ensure that these efforts yield a degree of prosperity for all citizens. Fortunately, there are many promising models we can learn from. We hope that the model we have presented here can be extended to the national and international landscape, and that others will use it to take on complex challenges on the economic, political, environmental, and health-care fronts. The world’s cities need more than ever to keep pushing forward together to realize the full innovative potential of their citizenry. The work is far from finished. Christopher Gergen is CEO of Forward Impact, which develops entrepreneurial working and living communities, and the cofounder of Forward Cities, a national learning collaborative focused on building inclusive innovation economies. Christopher is currently Innovator in Residence with the Center for Creative Leadership and a Fellow with Duke University’s Innovation & Entrepreneurship initiative. Lyndon Rego is the Director of Innovation and Global Director of Leadership Beyond Boundaries at the Center for Creative Leadership®. He and his team were the recipients of the 2014 Global Work Award from the Organizational Development Network. Lyndon has delivered programs in leadership development, innovation, and train-the-trainer on several continents.